Tyson Miller is really beginning to impress me. The 2016 draft pick from California Baptist is one of the most improved arms in the system this year. His fastball is sitting around 91-93 and topping out at 95. In April, he put up a 3.15 ERA in 20 innings while striking out 22. Miller began May by going 7 innings with 7 Ks on just 3 hits. What I really like about Tyson this year is that his newfound velocity comes from added muscle. Transitioning from college to pro baseball can sometimes be quick and can sometimes take a couple of years. To go from pitching once every seven days to every six takes some time to adjust. The pitcher also goes from a four month season to what basically amounts to a seven month season. For Miller, he went from Division II to the pros, which carries its own set of differences. Taken in the fourth round of the 2016 draft, Miller began his career as a limited starter in Eugene. He didn’t impress a whole lot other than his large 6’5” and 200 lb. frame and his athleticism. And that’s probably what the Cubs were banking on. His first year as a pro saw him make 2 scoreless starts at Mesa before he went to Eugene where he got in 22.2 innings and struck out 14 but struggled with a .289 batting average against. 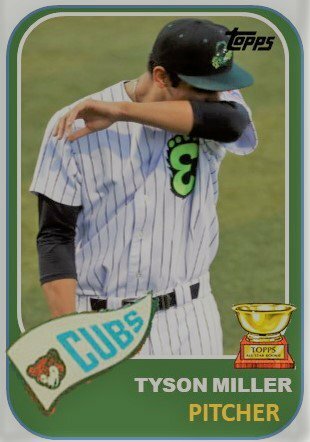 At South Bend in 2017, Miller was a workhorse for the Cubs who took the ball every six days and worked very hard at his craft. When I stood close to him in Beloit, I was impressed with the actual physicality of him. He’s a big dude and there is a lot of room to add some weight and muscle, which he has done the past year. On the mound, though, his performance in 2017 varied from month to month. His best month was in June where he made 5 relief appearances and got in 16.1 innings with a 3.31 ERA and he whiffed 13 batters. For Miller, though, he has been able as a starter to miss bats at each level. This year, his Ks are coming at a much higher rate. He is striking out over a man an inning. Last year at South Bend, he struck out 99 in 120 innings. I really like the fact that his innings per appearance this year are also increasing. At South Bend, he averaged four innings per appearance. This year, he is at almost 6. That’s a dramatic shift and one that I like. All his other stats in 2018 are trending in the right directions as well. K rate up to 9.67 from 7.38. BB rate down to 2.67 from 2.83. K to BB ratio up to 3.63 from 2.61 and HR rate down to 0.67/9 from an already low 0.75. His K% is up to 25% from 19% and the trends continue for walk percentage, BABIP, batting average against, left-on base percentage, and FIP. At 22-years-old, Miller has all the right attributes for the type of starter the Cubs want. Questions still remain about whether he can fulfill his potential. One month does not a MLB starter make, but Miller needs to continue ascending start-by-start and month-by-month. This year’s improvement is an important step in Miller’s development. And the key thing I like is that Miller is just beginning to develop. I look forward to see how he continues tonight, this month, and beyond.